Hollywood is infamous for its vast amount of remakes, sequels, and adaptations from books, comics, and television programs, but Pirates of the Caribbean: The Curse of the Black Pearl broke new ground by being adapted from a ride at Walt Disney theme parks. However, undoubtedly to the surprise of many, it was actually a success, slightly so critically, but largely so financially, setting the foundation for one of the highest grossing film series of all time. Ignoring the fact that the film was based on an amusement park ride, what further made this success a marvel was the fact that pirate films hadn’t been popular in some time, the last one being the bomb that was Cutthroat Island in 1995. 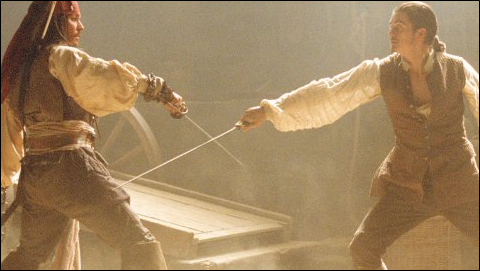 The movie follows the adventure of three protagonists: the breakout character Captain Jack Sparrow (Johnny Depp), defined by his unique mannerisms, guile, and selfish ambitions; William Turner (Orlando Bloom), heroic, selfless, and admittedly bland; and his love interest, Elizabeth Swann (Keira Knightley), beautiful, determined, and just as uninteresting, save for her occasional displays of wit rivaling her opponents’. When pirates attack Port Royale led by Barbossa (Geoffrey Rush), captain of the Black Pearl, Elizabeth is kidnapped due to an assumed relation to one “Bootstrap Turner” that they believe is the key to breaking a curse that has transformed them into the walking dead. With no one to turn to, Will begrudgingly joins forces with (Captain) Jack Sparrow to save her, though the latter’s motives are quite a bit more devious than he lets on. (Captain) Jack Sparrow is one of my personal favorite characters in film, and he is played perfectly by Depp. His dark side is perfectly balanced by his wit, charm, and often buffoonish antics that are guaranteed to make you laugh. His larger than life character is a blessing, as it compensates for the substantially less interesting Will and Elizabeth. Their characters and arcs lack the depth to be compelling, but there are quite a few other characters that also make up for this, such as Rush’s dastardly portrayal of the pirate Barbossa. The score is perfect, notably Hans Zimmer’s renowned theme. The action is fast and constantly exciting, though the tension is often alleviated by cuts to the hijinks of supporting characters. The story here is just what one looking for an exhilarating adventure would want, though to a certain extent. The movie does feel somewhat tiresome by its climax, which has so many reversals that the film may end up confusing you at times as to who is on whose side, for what reasons, and how. Nonetheless, when it comes to grand battles, larger than life characters, dialogue full of quotable repartee, and amazing treasures, you can’t go wrong with taking a dive into The Curse of the Black Pearl.